^ 1.0 1.1 1.2 1.3 1.4 E. Sala. Soccerway. [2019-01-04]. （原始内容存档于2019-01-05）. ^ 2.0 2.1 2.2 "It's hopeless, you can't believe": Emiliano Sala father after the disappearance of the flight. vaaju.com. 2019-01-22 [2019-01-22]. （原始内容存档于2019-01-23）. ^ Emiliano Sala feared dead: desperate hunt for missing plane with Cardiff City's new £15m striker on board called off for the night. London Evening Standard. 2019-01-22 [2019-01-22]. （原始内容存档于2019-01-22）. ^ 4.0 4.1 4.2 Bories, Flavien. Emiliano Sala: Quand je Veux Quelque Chose je Me Bats. sofoot.com. 2017-03-05 [2019-01-22]. （原始内容存档于2017-07-05） （法语）. ^ Furlone, Aquiles. Darío, hermano de Sala: “Lo único que ha hecho toda su vida es estar con la pelota. Mundo Deportivo. 2019-01-22 [2019-01-23]. （原始内容存档于2019-01-24） （西班牙语）. ^ 6.0 6.1 Todo el pueblo francés está en shock. Olé. 2015-11-27 [2019-01-26]. （原始内容存档于2019-01-26） （西班牙语）. ^ Bougis, Axel. Sala: J'ai Beaucoup Regarde Batistuta. sofoot.com. 2014-02-14 [2019-01-22]. （原始内容存档于2018-11-13） （法语）. ^ 8.0 8.1 Joven futbolista de Progreso tiene su destino en España. El Santafesino. 2007-09-09 [2019-01-22]. （原始内容存档于2019-01-23） （西班牙语）. ^ 9.0 9.1 Emiliano Sala jugará en la Premier League de Inglaterra. Diaxdia. 2019-01-21 [2019-01-22]. （原始内容存档于2019-01-23） （西班牙语）. ^ Jogador argentino desaparecido em avião começou a carreira no Crato. Record. 2019-01-22 [2019-01-23]. （原始内容存档于2019-01-23） （葡萄牙语）. ^ Quem é Emiliano Sala, contratação mais cara do Cardiff que está desaparecida em voo?. Globoesporte. 2019-01-22 [2019-01-23]. （原始内容存档于2019-01-23） （葡萄牙语）. ^ 12.0 12.1 12.2 Baron, Jeramie. Comment Emiliano Sala (Nantes) s'est fait un nom dans les divisions inférieures avant de briller en Ligue 1. France Football. 2018-03-04 [2019-01-22]. （原始内容存档于2019-01-23） （法语）. ^ 13.0 13.1 Moore, Steven. Emiliano Sala: From Serie C Reject to Ligue 1 Top Scorer. Breaking the Lines. 2018-11-21 [2019-01-22]. （原始内容存档于2019-01-22）. ^ 14.0 14.1 14.2 White, Adam. Emiliano Sala, the humble forward who enriched everyone's lives. The Guardian. 2019-01-22 [2019-01-22]. （原始内容存档于2019-01-23）. ^ Lyon vs. Bordeaux - Football Match Summary - February 8, 2012 - ESPN. ESPN.com. [2019-02-03]. （原始内容存档于2018-10-14）. ^ Emiliano Sala. FootballDatabase.eu. [2013-07-02]. （原始内容存档于2012-05-15）. ^ 17.0 17.1 Rostac, Matthieu. Emiliano Sala: Pret du But. sofoot.com. 2015-02-27 [2019-01-22]. （原始内容存档于2017-03-15） （法语）. ^ Chochois, Alexandre. Niort: Un buteur de Bordeaux débarque en prêt (off.) [Niort: Bordeaux striker arrives on loan (official)]. foot-national.com. 2013-07-02 [2013-07-02]. （原始内容存档于2013-07-06） （法语）. ^ BORDEAUX : SALA PROLONGE DE DEUX ANS. mercato365.com. 2014-07-03 [2019-01-27]. （原始内容存档于2019-01-28）. ^ 20.0 20.1 Emiliano Sala, Un Atout Supplementaire Pour Le Maintien. SM Caen. 2015-01-28 [2019-01-22]. （原始内容存档于2019-01-23） （法语）. ^ Emiliano Sala, un atout supplémentaire pour le maintien. smcaen.fr. 2015-01-28 [2015-01-29]. （原始内容存档于2015-02-17） （法语）. 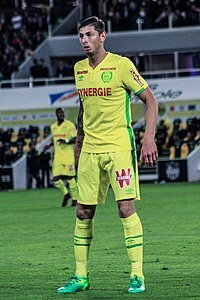 ^ Nantes make Sala a canary. Yahoo Sports. 2015-07-20 [2017-05-15]. （原始内容存档于2018-08-17）. ^ 23.0 23.1 23.2 White, Adam; Devin, Eric. The most prolific Argentinian striker in Europe this season? Emiliano Sala. The Guardian. 2018-11-05 [2019-01-22]. （原始内容存档于2019-01-02）. ^ Aarons, Ed. Nantes reject £3m bid from Wolves for forward Emiliano Sala. The Guardian. 2016-01-22 [2019-01-23]. （原始内容存档于2019-01-02）. ^ Dupont, Régis. Emiliano Sala cut for the fight. L'Equipe. 2017-10-20 [2019-01-27]. （原始内容存档于2019-01-28） （法语）. ^ 26.0 26.1 Yew, Oliver. In Profile: Emiliano Sala. Sky Sports. 2019-01-25 [2019-01-27]. （原始内容存档于2019-01-23）. ^ Sala hits three as Nantes crush Toulouse. www.ligue1.com. 2018-10-20 [2019-02-08]. （原始内容存档于2018-10-23）. ^ Ligue 1: Emiliano Sala voted best player of the month of October. L'Equipe. 2018-11-12 [2019-01-27] （法语）. ^ Emiliano Sala revient sur Kylian Mbappé : le classement dynamique des buteurs de Ligue 1 après la 16e journée. L'Equipe. 2018-12-05 [2019-01-27]. （原始内容存档于2019-01-28） （法语）. ^ Emiliano Sala: Cardiff City sign Nantes striker for undisclosed club-record fee. BBC Sport. 2019-01-19 [2019-01-22]. （原始内容存档于2019-01-20）. ^ Abbandonato, Paul. Cardiff City announce signing of goal ace Emiliano Sala in club record £15m deal. WalesOnline (Media Wales). 2019-01-19 [2019-01-19]. （原始内容存档于2019-01-20）. ^ Disparitiom D’Emiliano Sala : Bordeaux Dement Avoir Reclame De L’Argent À Nantes. football365.fr. 2019-01-27 [2019-01-27]. （原始内容存档于2019-01-28） （法语）. ^ Abbandonato, Paul. Cardiff City £15m 'capture' Emiliano Sala rejects huge 11th hour Chinese offer – French reports. WalesOnline (Media Wales). 2019-01-19 [2019-01-22]. （原始内容存档于2019-01-23）. ^ Emiliano Sala: Nantes demand transfer fee from Cardiff City. 2019-02-06 [2019-02-08]. （原始内容存档于2019-02-07） –通过www.bbc.co.uk. ^ 35.0 35.1 Booth, Dominic. Who is football agent Mark McKay, his relationship with Emiliano Sala, Cardiff City and his academy twin brothers?. WalesOnline (Media Wales). 2019-01-24 [2019-01-25]. （原始内容存档于2019-01-25）. ^ James, Stuart. 'Subdued’ Cardiff City players train as Emiliano Sala dominates thoughts. The Guardian. 2019-01-23 [2019-01-25]. （原始内容存档于2019-01-24）. ^ 37.0 37.1 Morris, Steven. Emiliano Sala's family hire submarine to hunt for missing plane. The Guardian. 2019-01-28 [2019-01-29]. （原始内容存档于2019-01-29）. ^ Emiliano Sala: Search for Cardiff City FC player's plane suspended. BBC News. [2019-01-22]. （原始内容存档于2019-01-22）. ^ 39.0 39.1 Lewis, Anna. Inside the search for Emiliano Sala: What happened during three grueling days that ended in vain. WalesOnline (Media Wales). 2019-01-26 [2019-01-26]. （原始内容存档于2019-01-26）. ^ Rescuer has 'no hope' for missing player. BBC News. 2019-01-23 [2019-01-23]. （原始内容存档于2019-01-23）. ^ Emiliano Sala's audio message from plane. Sky Sports. [2019-01-23]. （原始内容存档于2019-01-24）. ^ Parveen, Nazia; Morris, Steven. Emiliano Sala pilot's friends 'surprised' he took night flight. 2019-01-25 [2019-02-08]. （原始内容存档于2019-02-05） –通过www.theguardian.com. ^ Emiliano Sala: Search for footballer and pilot called off. BBC News. 2019-01-24 [2019-02-08]. （原始内容存档于2019-01-24）. ^ Emiliano Sala: search for footballer and pilot called off. The Guardian. 2019-01-24 [2019-01-24]. ISSN 0261-3077. （原始内容存档于2019-02-04）. ^ Emiliano Sala: Lionel Messi leads calls from across football for search to resume. BBC Sport. 2019-01-25 [2019-01-26]. （原始内容存档于2019-01-26）. ^ Messi and Maradona plead for Sala search to continue. Belfast Telegraph. 2019-01-25 [2019-01-27]. ^ 47.0 47.1 Emiliano Sala: Argentina president backs new search for footballer. BBC News. 2019-01-25 [2019-01-26]. （原始内容存档于2019-01-25）. ^ Farrell-Roig, Estel. Emiliano Sala's family to organise for private search boats and divers to find missing Cardiff City footballer. WalesOnline (Media Wales). 2019-01-25 [2019-01-26]. （原始内容存档于2019-01-26）. ^ Doel, Jon; Sands, Katie. Live updates as new Emiliano Sala search launched following remarkable fundraising campaign. WalesOnline (Media Wales). 2019-01-26 [2019-01-27]. （原始内容存档于2019-01-27）. ^ 50.0 50.1 Emiliano Sala search: Footballer's family thanks donors. BBC News. 2019-01-27 [2019-01-27]. （原始内容存档于2019-01-27）. ^ McGeehan, Matt. Arsenal remember Emiliano Sala with touching programme tribute to missing Cardiff striker. Evening Standard. 2019-01-29 [2019-01-29]. （原始内容存档于2019-01-30）. ^ Sands, Katie; Walford, Jessica. Parts of missing plane carrying Emiliano Sala and pilot found on beach. WalesOnline (Media Wales). 2019-01-30 [2019-01-30]. （原始内容存档于2019-01-30）. ^ Weaver, Matthew. Emiliano Sala's 'body could be found among plane wreckage'. The Guardian. 2019-02-04 [2019-02-08]. （原始内容存档于2019-02-04）. ^ Emiliano Sala: Missing Premier League footballer's plane found. Sky News. [2019-02-03]. （原始内容存档于2019-02-04）. ^ Sala plane wreckage found in Channel. 2019-02-03 [2019-02-03]. （原始内容存档于2019-02-04） （英语）. ^ 'One occupant visible' in Emiliano Sala plane wreckage - investigators. Sky News. [2019-02-05]. （原始内容存档于2019-02-04）. ^ Emiliano Sala crash: fuselage of plane with one body on still on board pictured on seabed. MSN. [2019-02-05]. （原始内容存档于2019-02-07）. ^ Body recovered from plane which crashed into English Channel confirmed as footballer Emiliano Sala. ITV News. 2019-02-07 [2019-02-07]. ^ Nantes retire No 9 shirt in honour of Emiliano Sala. BBC Sport. 2019-02-08. ^ Doel, Jon; Booth, Dominic. Live updates as inquest into Emiliano Sala's death adjourned. walesonline. 2019-02-11 [2019-02-11]. ^ Bielderman, Erik. Emiliano Sala: Profile of 'a South American warrior' & the 'local Carlos Tevez. BBC Sport. 2019-01-22 [2019-01-22]. （原始内容存档于2019-01-22）. ^ 68.0 68.1 Yew, Oli. In profile: How hard work helped Emiliano Sala become Nantes hero and earn Premier League transfer. Sky Sports. 2019-01-23 [2019-01-23]. （原始内容存档于2019-01-23）. ^ Morgan, Tom. Emiliano Sala: Who is Cardiff's £15m record signing?. The Telegraph. 2019-01-22 [2019-01-22]. （原始内容存档于2019-01-22）.